I have had a little journey to Utopia, today. It was a snow-covered, simple, centuries-old relic of a utopia which survives in pockets, here and there. I have experienced the simplicity and kindness of a group of people whose philosophy once so irked the English establishment that mass emigration seemed the only way forward. And I have stood at the graveside of the man whose fair-mindedness, whose stubborn refusal to compromise, led him to found a place where man could be free to worship and conduct his life as he chose. A trailblazer, this man. And not without his connections. His father, William Penn the elder, was a mover and a shaker, who, despite his roundhead sympathies, helped bring King Charles II back to England for Restoration. And King Charles never quite forgot that. That, and a matter of some £16,000 Charles owed him. Penn was a Navy man, through and through. But his son, from a very early age, was a dreamer. At 15, a visitor to his father’s Ireland household struck the young Penn deeply: Thomas Loe, a Quaker missionary, spoke of his ideals and William listened, profoundly moved. When William went to Oxford, the Quakers were already being ostracised there, and though the young man was ostensibly a Cavalier because of his father’s aid to the crown, he hated to see them set apart. He withdrew into his studies; but when rules at Oxford became stringent, and students were forced into Anglicanism, he rebelled openly. His father, expediently, sent him to France, where he learnt fabulous dress sense but balked at the excess. And soon he was back, studying law, acting as emissary between his father and the king; and lamenting at the suffering cased by the plague of 1665. On his return to the family estates in Ireland, he declared himself openly, at the age of 22, to be a Quaker: a member of the Religious Society of Friends. His fight for the right to worship freely is well documented. It is a stirring tale which culminates in the unimaginable: the mass emigration of English Quakers to a huge tract of land in America. It was Penn who carved a deal with Charles II to allow the Friends to travel away, across the ocean, to a fairer place. Yet his feel for what was fair and just fuelled the Frame of Government for Pennsylvania, which in turn influenced the United States Constitution. Whilst his values helped found a state, they did not guarantee security for himself. His son was a dissolute gambler,running up debts; Penn himself had loaned generously without always giving thought to the money’s return; and his financial manager in Ireland, Philip Ford, had diverted funds from Penn’s Irish lands. Ford’s widow even launched a court case aimed at snapping up Pennsylvania, though it floundered. Unthinkably, this giant died penniless, in a village in Berkshire, England. He was buried at the Quaker cemetery in Chalfont St Giles in Buckinghamshire. I arrived at Jordan’s Meeting House to find it white. Snow had fallen heavily in Buckinghamshire. And though it was not open, I rang the bell and someone welcomed me warmly and showed me the meeting house where, surely, Penn must have stood and worshipped. It was simplicity itself, without pulpit or ornament: a plain place for people to meet and pray. 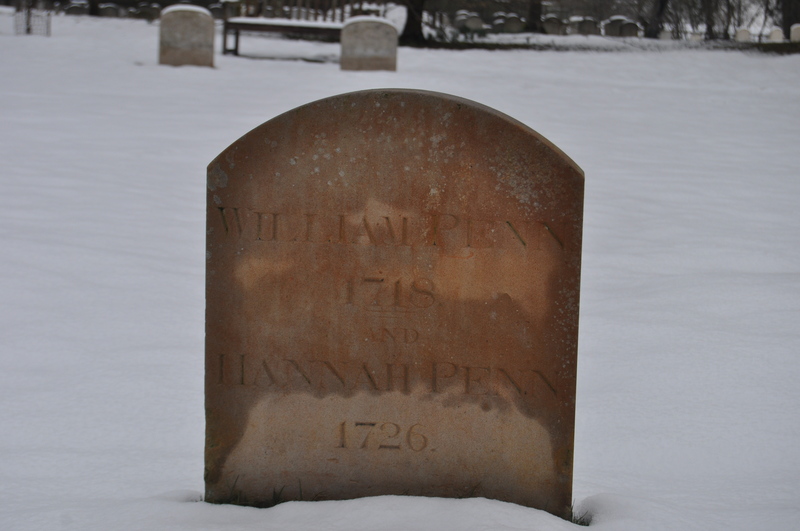 And once I had seen the quaint 17th century interior, I stepped outside and crunched across virgin snow to find the stone where Penn sleeps. Every stone is the same, there in the glade outside. There are no angels or monuments. Was it the unassuming, snow-capped markers whose very humility whisked the breath away? Or perhaps it was just the freezing wind which whipped the fingers and face as I stood in something like awe. Here was fair-minded equality, perfect democracy, even in death. Mr Penn, for your breathtaking endeavours, and your fair-minded audacity, on a white-blanketed English February morning, across the centuries: I salute you. Posted in Quirks of HistoryTagged history, Jordans Meeting House, Pennsylvania, Quakers, Society of friends, William PennBookmark the permalink. His was qute a story, Julie. What a great study of an inspiring man, Kate. I do wonder if many Americans know even a small portion of this story. You have really inspired a renewed interest in the man! I do have one Penn quote I learned many years ago, ” Right is right, even if everyone is against it; and wrong is wrong, even if everyone is for it.” I had it framed and on my desk at one time many years ago. I think Penn is known for many wise sayings! We need men and women today with his strength of conviction! I love the quote, Debra. It shows a rare ability to hold one’s position, no matter who surrounds us. Good to be reminded that, Penn, a name so quintessentially American, is primordially British. Methinks he’d have liked his humble marker. I like the warmth of the worn, old wood inside. The chairs with the rounded arms are similar to an elegant antique tablet chair I inherited from my parents. Similar lines but with a tablet built into the right arm. Makes a great writing surface, or a place to eat. Have never seen another like it. Nice to know more about the man who founded the state I grew up in. I wonder why he didn’t go to Pennsylvania to live. Actually, he did, Jennifer: he was out there running things from 1677, when all the Quakers went out, until 1684; heb returned from 1699-1701. It was money worries which brought him back to England; his heart lay, I think, in Pennsylvania. Pleasure! A Quaker school must have been quite an experience. I have known little about this figure in history. It would seem he was, for all the simplicity he espoused, a complex character indeed . Only with that complexity could he have pulled something like this off, Col, I think. Fabulous. Jordans is open from March 1 onwards. Make sure you hike up the hill and look at the Mayflower Barn too: folklore says it was made out of the timbers of the ship which took the Pilgrims from Plymouth across the ocean to America. But as there were more than 40 Mayflowers sailing at the time, who knows if this is really the right one? It is upsettingly ironic that Philadelphia, “The City of Friends”, is so seedy and unsafe in some areas that police and firemen do not respond to alarm calls and gunshots and thugs rule the night in some places. Isn’t it? I love tracing maps of Manhattan from the earliest times – when it was New Amsterdam – until the present day. All that green land gone. That looks a beautiful place, Nancy! A perfect place for a picnic, should I ever make it there. Somehow you captured the peace and the power. I wonder did the snow add to the something special? Simple philosophy, do right and keep it simple. Indeed. So refreshing to read about now. The Quakers were the very first settlers to the area where I live.Though their foot print has lessen if not completely gone. A few farm houses built in the 1800’s and one restored Octagon House. A local pioneer cemetery or Burying Grounds tells their story best, next to that an Empire Loyalist cemetery all part of the local heritage that connects to the place where your Penn rests. But the one thing that I value most of this local colony happened In 1829. These Quakers are attributed with helping to build and finance a small community for freed and escaped slaves from the United States, which in turn later on served the needs of the Underground Railroad by being a safe haven for many who were helped into Canada by Harriet Tubman and others. Your snowy images speak to me of a long gone colony who’s belief in austerity shaped my country and community. Perhaps is more owing to the Quakers than we are to Britain, the country they shipped from……….Good shtufffs Kate. Thanks Hudson. I think you are right: the Quaker legacy is strong in your part of the world. And anywhere it is strong, I would feel comfortable being; the people I met today were so warm and welcoming. Thanks for sharing these wonderful pictures and the information about Penn. Pleasure, Steven. He was such a compellng character. Your posts never fail to inspire and you have succeeded again. Wish I knew your secrets, or perhaps my lack of ability to come close to your talents makes those special secrets forever a mystery to me. I am Soooo glad you are around to edify, inspire, and entertain! Lately your dear Mum has been on my mind and heart – along with your fab Dad! How are they getting along and how are the rest of the inhabitants of Shrewsday Mansions? Hi Paula! Mum is fine, thanks, and has come through a string of brain ops with flying colours, thank goodness.Hope you are all well? I’m a bit embarrassed that I did not know he had returned to England in his later years. As a graduate of Penn, I think I should’ve known that. I love your calling it a democracy – even in death. Nice post Kate. Thanks, Tammy. I, in turn, did not know this giant was buried so close. Some things are left for us to question, I guess: for me, discovering things like this makes the world go round.. I was struck by a sense of peace and permanence here, Brett. You would ahve loved it. Very belated. I wish I had read this when I was in PA. I would have walked over to City Hall to salute once again the statue of the man that stands at the top. I had no idea he did, Andra: and have googled to find pictures. How exciting! If I make it there I must go and visit with him. It is a lovely building with an open courtyard in the center. I love walking through there at any time of day. I’m sure you know it’s a hub for US Airways, but I don’t know whether Phil’s new role allows for flights with them. From London, it has to be a short enough flight for Felix to master, though. Up until I was nearly 8, I lived in Harrisburg and Philadelphia, Pennsylvania. My family still lives around those areas. From your story, and my reading about him when I was a teen, I do admire what William Penn’s faith and what he tried to accomplish. Sad to learn that he died penniless. I’m interested to learn whether Quakers still have a foothold in the state, Judy. Or whether everything Pennsylvania was has disappeared. I never knew that Penn wasn’t buried in the US. Come to think of it, I never knew that much about him beyond his Quaker religion and the founding of the Commonwealth of Pennsylvania. I learnt he was here by pure fluke. All right, using my 1965 AA book of the road to help me. Amazing what a little exploring can do.